It's been a widely accepted truism that each of the Marvel movies adopts tropes of a different genre of film. Or as MCU head honcho Kevin Feige said in late 2015: "I don't believe in the comic book genre. I don't believe in the superhero genre. I believe that each of our films can be very different." So if that's the case, what kind of film is Ant-Man and the Wasp, which is now playing in the US and will arrive in the UK on August 3? According to a recent SFX interview with director Peyton Reed, it's a road trip movie. 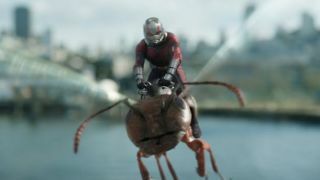 "[Hank Pym and Hope van Dyne are] on the lam and since the Ant-Man universe takes place in San Francisco in this farthest off corner of the Marvel Cinematic Universe, I really wanted to feel the city of San Francisco a lot more than we did in the first movie," Reed said. But of course, if our protagonists didn't change or grow, it would be less of a road movie, more of a vacation slideshow. Thankfully, along with a few new villains to deal with, Scott Lang (aka Ant-Man) and Hope have to deal with each other, giving audiences plenty of fun drama to watch unfold. "We definitely had ideas of what we wanted to do with these characters and what that second movie could be and it was always about Scott and Hope," Reed told SFX. "The arc really is about how they learn to come together as a team and really what that means." For more behind-the-scenes on Ant-Man and the Wasp, be sure to read the latest issue of SFX. You can buy SFX on Google Play and Zinio, and most digital formats give you a 30-day free trial, so you can try before you buy! For Apple users: click the link and you’ll be directed to SFX's page in the App Store – once there, install the SFX app, or – if you’ve done that already – hit Open to be taken to the SFX storefront.